Today is the last day to enter our Winterland giveaway. Just comment on this post to be entered. It's the end of a long holiday weekend for me. I had four days off for Thanksgiving and I have had a wonderful time! Hope your holiday was fabulous too! Today I want to share a mini album I made using both Forever Fall and Autumn Glory. The acorn shaped chipboard album has been in my stash for a long time, so long I am uncertain who gave it to me, but I do remember it was something given to me and not an item I purchased myself. That is another thing to be thankful for right there, great scrappy friends! I heat embosed several metallic shades on the album cover to give it richness. The small photos were matted on kraft tags, which is a great use for any extra tags you have lying around! Hi Moxxie fans! Dana here with you today sharing a layout that I created with the Forever Fall collection, which is perfect for documenting fall festivities. Today being Thanksgiving, I thought I'd share this layout. I'm thankful for many things, especially my niece and nephew! I created a small embellishment cluster with my favorite Moxxie owl sticker and some felt flowers. I cut some colorful leaves from the Forever Fall Autumn patterned paper to scatter along the bottom of my photo. Thanks so much for stopping by today! I want to wish those who celebrate a Happy Thankgiving or Hanukkah! If you've picked up the Forever Fall collection, we'd love to see what you are creating! Stop by the Moxxie facebook page to share you work or leave a link in the comment section of this post. Hi! Ange here today with a couple of fun cards. I used Moxxie's Forever Fall line for these cute cards. On this first one I picked my base, added some sanded Pebbled cs from DCWV, used some scraps of Foilage along the bottom and then fussy cut the cute leaves from Unbe-leaf-able & Fall cards for my leaf pile. 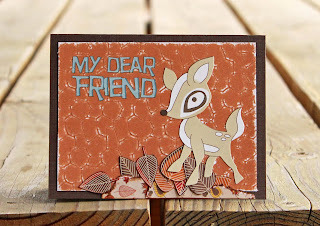 Then I used the My Dear Friend rub-on and this adorable little deer sticker. I love this little deer, I've been waiting for the perfect place to use him. This card is a birthday card for my daughter. 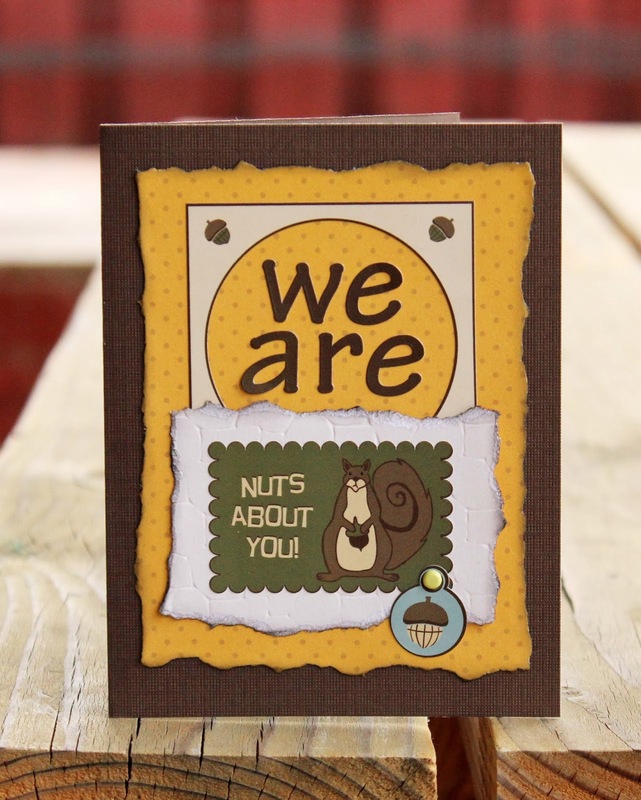 I love this Nuts About You! sticker and thought it would be perfect for this card. The yellow polka dotted paper is the backside of Fall cards, the additional stickers are off of the Alpha sticker sheet and the white cs is from the Pebbled DCWV stack. I added a couple more stickers with a birthday sentiment inside. These cards were fun and easy to make using Moxxie's awesome cardstock stickers! Hope you have a great weekend. Hi Moxxie fans! 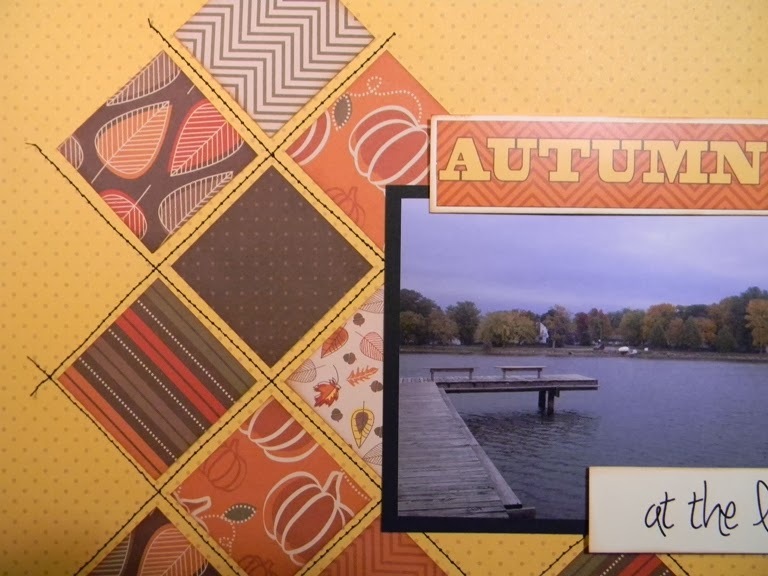 Dana here today sharing a layout that I created by mixing the new Forever Fall collection with the older Fall Frolic collection. Both lines share shades of orange, green and brown, but the Fall Frolic collection also has a beautiful blue patterned paper that really helped to brighten up my page. I snapped this photo of my daughter during a hayride at a local farm. There were several scenes, complete with actors and props, set up along the route and she really got a kick out of the alien crash site! I couldn't resist using Moxxie's fantastic cardstock stickers to embellish my page. Each collection has similar shaped stickers and I was able to layer two circle stickers to create this fun "Autumn Owl" piece. Absolutely beautiful! Now for our last 2 projects. Michelle here today with a fun layout. I get a lot of inspiration from Pinterest. This page I created is from an idea I saw from Lisa Dickinson. You can see the original pinterest post here. I just thought the design was super cute and I could see it working great for the Forever Fall line. So this is what I made using her example. It is a simple page but it includes a lot of detail with the squares and the stitching. And, it shows off the photo which is the important part of scrap booking, right? I hope you have enjoyed my layout design. I've seen a few different ideas for these around the internet, but they are super easy to make and change to suit your purpose. 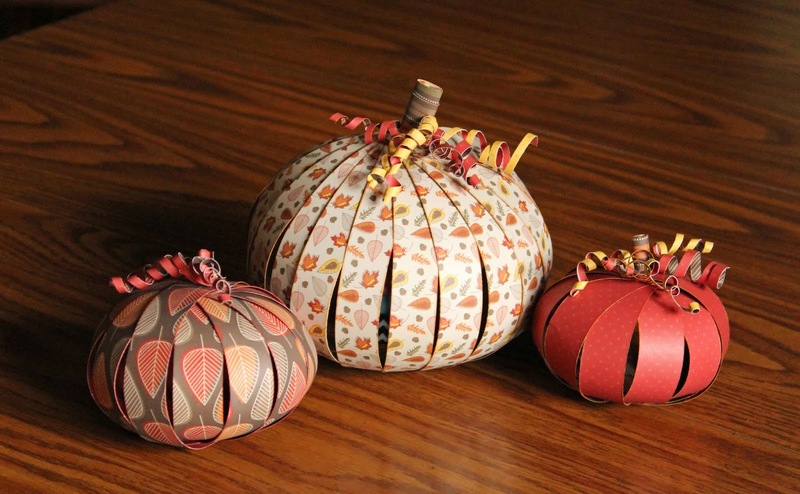 For the larger pumpkin I cut Moxxie's Foilage paper into strips about 9x7/8 inch, inked them and then put a brad through each end (I used a whole punch to make it easier) with the papers stacked, fan them around until you have your pumpkin. Then cut some scraps into super thin pieces, curl them up and add them for "vines" and a wider scrap rolled for the "stem". The bigger your pumpkin the more strips needed to make it full, I probably used around 20 strips for the larger pumpkin. My 4yr old son kept asking me if there was candy inside. Not a bad idea! Now for the details on how to WIN this amazing line. Fellow Muses have posted projects every day this week. So go back to see their projects and leave comments each day for an entry. Also, we want to know you follow us on facebook, so comment there and share this post on your own facebook page for additional entries. Last but not least, send your friends! Tell them to let us know who sent them and you get another entry to win! That gives you a total of 7 ways to enter, plus one for each friend that lets us know YOU sent them. We will announce the winner, here, on the blog Monday morning. Happy scrapping and thanks for joining all of us for Fall fun this week! Welcome to Day 3 of Moxxie's Forever Fall Inspiration Week! Susie here today to share a Project Life-style page...my first actually! Moxxie made it super simple. All it took was one sheet of the Fall Cards paper. The first panel is the perfect title card. I "prettied it up" with a pearl flourish from Want2Scrap. The next panel I flipped over, added some leaf stickers from the Alpha Card Stock Sticker sheet and stamped a journaling block. The photograph on the left covers some pre-printed text. I made the ticket myself - don't you just love little piggies?! I used this journaling block to describe my son at 12 by adding word stickers. Here's a quick peek at some of my other layouts using this collection - I just love it! My fellow Muses are going to continue to show you how awesome this line is ALL week long!! So come back every day to see their projects and leave comments each day for an entry. Also, I want to know you follow us on facebook, so comment there and share this post on your own facebook page for additional entries. 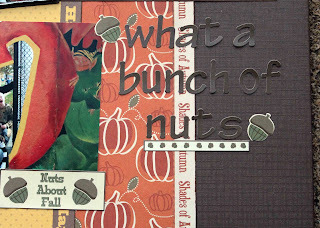 Other Products: Want2Scrap Finesse Swirls Pearl, We R Memory Keepers page, MME stickers, Kaisercraft stamp. Hi Moxxie fans! Moxxie Muse Dana here today welcoming you to Day 2 of the Forever Fall feature. If this is your first visit to the blog this week, you'll want to scroll down to see the layout that Rebecca shared yesterday. Keep reading to find out how you could WIN the entire Forever Fall collection! The leaves on the trees in my yard have changed into beautiful shades of red, orange, and yellow and are slowly falling from the branches. I'm enjoying the crisp mornings and the crunch of dry leaves under my feet. My daughters are thrilled that our house is surrounded by trees. They actually helped rake the leaves last weekend so that they could jump in the piles! I didn't miss this photo opp! 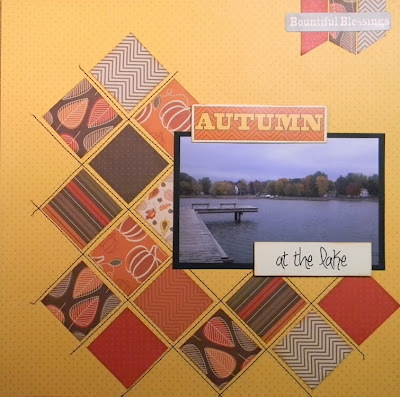 I used the colorful pennant stickers from the Forever Fall Cardstock Sticker Sheet for the title of my layout. I added some colorful leaf rub-ons, from the Harvest Rub-On Sheet, to my page. The color of the Moxxie rub-ons are so vibrant. The quality is also fantastic and the rub-ons really pop, even on busy patterned papers. Visit all the posts this week to see our Fighting Back projects and leave comments each day for an entry. Follow us on facebook. Comment there and share this post on your own facebook page for additional entries. Send your friends! Tell them to let us know who sent them and you get more chances to win! You have a total of 7 ways to enter, plus one for each friend that lets us know YOU sent them. We will announce the winner here on the blog on Monday morning. Be sure to stop by tomorrow to see what Susie has created to inspire you! Susie here with a super quick layout for your pumpkin patch photos. 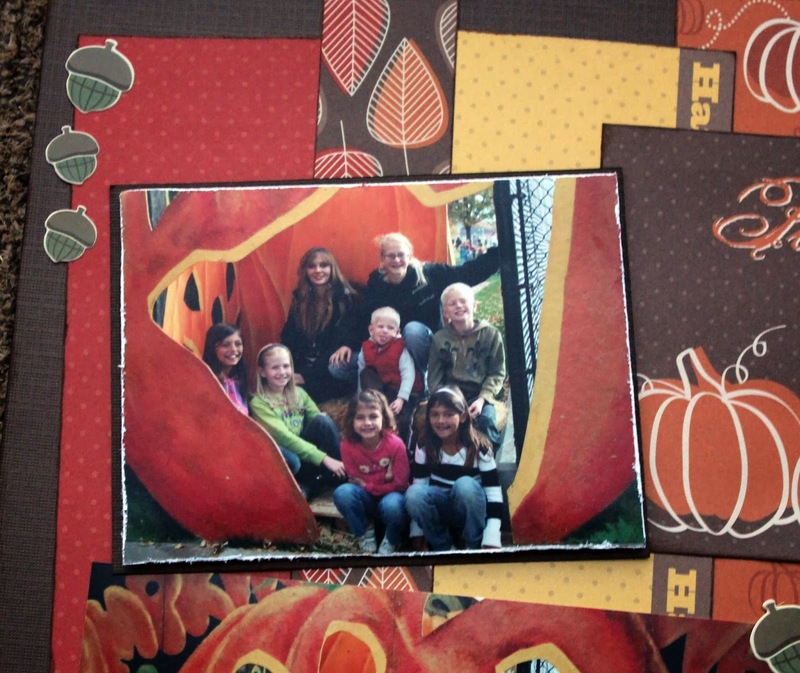 The Fall Cards paper is what made this so fast and easy! I started with a piece of dark brown cardstock that was 9.25" wide and 8.75" tall. Cut apart the Fall cards paper and add the first 2 cards to the top row, leaving about 1/8" on the top and each side. To create the next row, you will have to cut down the card that spells out "F-A-L-L" so that it is only 2" wide. Adhere it on the the right side. Cut the strip of leaves off of the journaling card and adhere it on the left side. 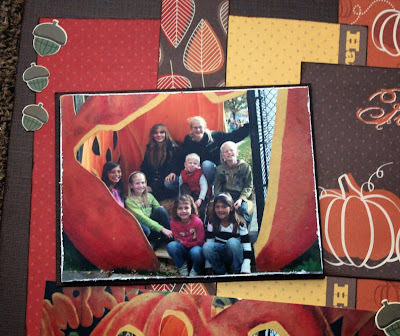 Trim your favorite pumpkin patch picture so that it is only 5-3/4" wide and adhere it into place in the bottom row. Cut the Pumpkin Patch edge strip to size and add across the bottom. Add an off-white mat with the slimmest of margins...maybe 1/16th all around. Adhere the entire assembly onto the background paper. Tuck a manilla tag under the panel on the top right for journaling. If you have plans to visit your local pumpkin patch this fall, be sure to reach for Moxxie's Forever Fall line to scrap it! October means pumpkins and Moxxie's Forever Fall line has the greatest pumpkins I've seen in a long time! I used the Pick of the Patch paper as the base for this fun layout. We have been going to the local pumpkin patch for years and my kids are pretty good about letting me have my annual photo shoot. I usually like to use more than one photo on a page,but I really love this shot of my 3 kids and decided it deserved a page of its own! I tore and inked the edges of the paper and then turned down the upper right hand corner to hold some of my homemade tickets. I matted the 5"x7" picture on green corrugated paper, then extended it so that I could include the title, created with coordinating alpha stickers. I prettied up the title block with a tree sticker and a little bling. I also trimmed out one of those cute little pumpkins and popped it up as an accent. Other Products: Want2Scrap bling, cardstock, corrugated paper, October Afternoon stickers. Go nuts with Forever Fall! Hello! I hope you're all doing well this fine fall day. Speaking of fall, I bring you a fun fall layout today, using the adorable Forever Fall line. We took these photos at a little local festival that we have in this area every year. My kids had lots of fun with their friends and it's so fun to see all the pumpkin displays they have. I'm looking forward to going again this year. I started with a dark brown base and then just picked patterns from the Forever Fall line that I wanted on my layout. I really love these little pumpkins, so that was my first pick. I also liked that I could put the bar code strips on because they have the fun fall wording on the back of them. 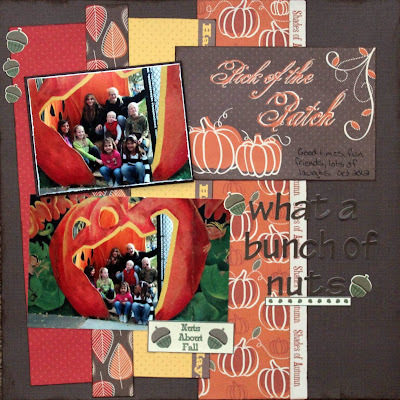 I also trimmed and distressed my photo so I could put the Fall card Pick of the Patch on the layout without crowding. I pretty much ink whenever and wherever I can, love ink. Here I used brown and black. I finished up with adding a fun little quote about my cute nuts. I love that the letters are the same color as the background but you can still see them really well because they crossover to the pp and have some fun stickers to help them pop. Add a few more stickers here and there and your done!